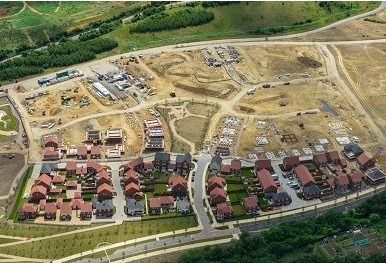 Landsec, the UK’s largest listed commercial property company, today announces the completion of the sale of Eastern Quarry, Ebbsfleet to residential infrastructure and placemaking firm Henley Camland for £66.8 million. The 269-hectare site, which includes the residential development of Castle Hill – the first of three villages to be delivered as part of Ebbsfleet Garden City – will be developed by Henley Camland in line with the resolution to grant planning permission issued on 20 December 2017. At Landsec, we believe great places are for people to experience and are made with the experience of great people. As the UK’s largest listed commercial property company, with 23.7 million sq ft of real estate and a portfolio valued at £14.2 billion, we own and manage some of the most successful and recognisable assets in the country. In London, our portfolio totals more than £7.8 billion, and consists of 6.5 million sq ft of real estate. From the world-famous Piccadilly Lights to the transformation of Victoria, SW1, we deliver exceptional experiences for the businesses and people that live and work in, and visit, the capital. In Retail, across our 17.2 million sq ft of assets, we create outstanding experiences for customers and guests alike. Combined with the strength and resilience of our portfolio, this means we regularly outperform industry benchmarks for footfall and sales. We offer more than convenience and choice, recognising that memorable destinations are key to attracting the shoppers and retailers of today, and tomorrow. We also aim to lead our industry in critical long-term issues – from diversity and community employment, to carbon and climate resilience. Everything we do is grounded in experience and begins with people. We deliver value for our shareholders, great experiences for our customers and positive change for our communities. At Landsec, everything is experience. Established in 2006, Henley is a leading UK private equity real estate investor focusing on development, investment and asset management in the commercial, residential, healthcare, land infrastructure, debt and other alternative real estate assets. Since inception, Henley has approximately doubled in size every year. The company currently has around $2 billion assets under management (as of mid-2017). Henley is an entrepreneurial company that continues to back entrepreneurs. Henley’s platform has multiple divisions, all headed by an experienced entrepreneurial partner; these include Henley Space, a prime London residential development.